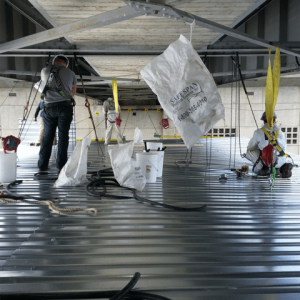 A shipbuilder in Superior, WI recently had a project where the insulation in the mechanical room below deck had moisture and condensation problems. 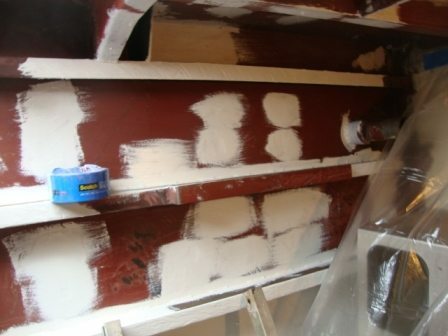 While remodeling other parts of the ship, the owner found out they needed to remove the insulation and apply a product to prevent condensation and other moisture problems. 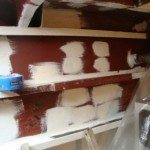 Once the insulation was removed, TMI Coatings, a commercial contractor, mechanically abraded the walls and the ceiling prior to applying a ceramic insulation to the ceiling and walls to prevent future moisture problems. TMI had to complete work in a tight time frame, as the builder had only 45 days from the time of dry dock to putting the vessel back into the water. 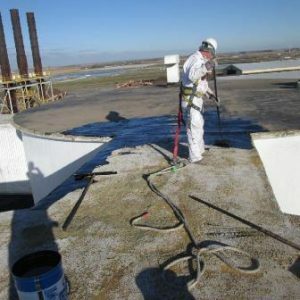 A NACE certified coating inspector was on site for the entire job to monitor surface preparation and coating by TMI Coatings crew. 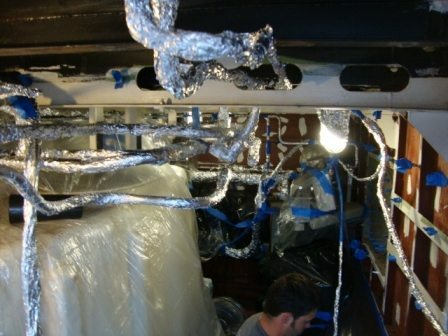 The photos show white primer on ship walls where rust was evident and aluminum foil and/or poly covering to protect piping and equipment in the area. 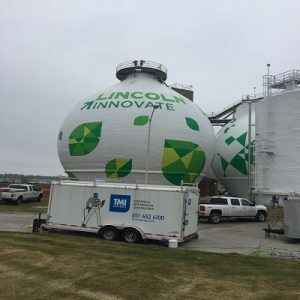 TMI was able to finish applying the ceramic insulation in a timely manner, working around the other tradesmen that were also completing projects during the 45 day dry dock period. TMI received an excellent report card from the owner for both meeting their schedule and quality workmanship in a small, congested area. 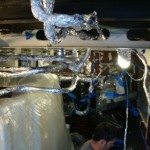 Foil and poly covering to protect piping and equipment.